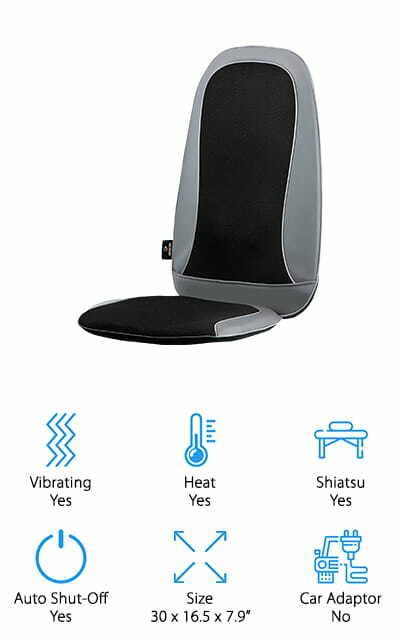 If you find yourself thinking that you could benefit from a massage more days than not, you might want to look into getting a chair massage pad. These pads sit between your back and the chair. Most have a vibration function and a heat function that work together to loosen muscles. Some even have motorized rollers that feel like a real massage! Our chair massager pads buying guide has you covered! First, let’s look at some things you should know. Vibrating: A vibrating massage helps loosen your muscles up and release any tension you’re carrying in them. Most of these pads have varying levels of vibration that you can control to help your muscles get perfectly relaxed. Heat: The heat feature will work to relax your tired muscles by loosening them gently. This is a desirable feature that helps the other massaging features work that much better! You’ll relax so much easier with heat. Shiatsu: Shiatsu is a type of massage that involves putting pressure on certain key points on the body in order to relax and release tension from entire groups of muscles. Some of these pads can simulate the feeling. Auto Shut-Off: Most of the pads on our list will shut off after a certain amount of time, allowing you to feel at ease and safe while using them. It’s no big deal if you happen to fall asleep using it. Size: The dimensions of the pad are important for seeing if it will fit in your chair, but also for determining if it’s going to be effective for someone of your height. Some pads are not effective for taller people. 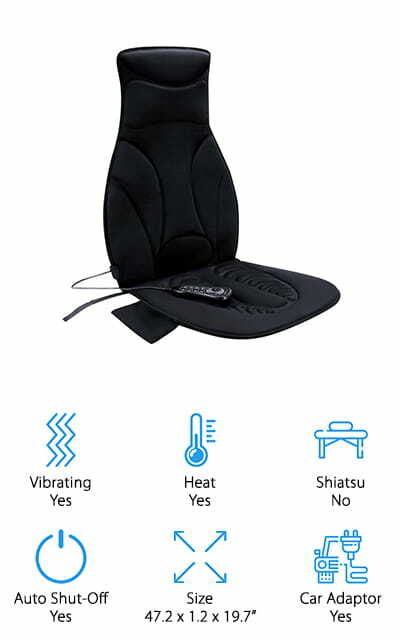 Car Adaptor: Some of the chair pads on our list come with a car adaptor, so you can get the heat and vibration while you’re traveling as well. It’s useful for the front seats but usually won’t reach the back. That’s everything you need to know about massage pads for chairs! Now we can get into the products. Our massage chair pad reviews were compiled from tons of researching and reviewing products in order to bring you the very best selection. Our top pick is the best we found, and your wallet will love our budget pick! The rest of our list is full of amazing chair massage pads as well, so check them out before making your final decision! Nothing is better after a long day than coming home to a massage. This chair pad will do its best to soothe your muscles and keep you relaxed. There are rollers inside the pad that is meant to imitate a real human Shiatsu massage, kneading your muscles and getting all of those tough knots out. The 8 massage nodes can be adjusted up and down. In addition, there’s a vibrating massage function for your hips and thighs, with three different vibration levels. It also has an optional heat function to loosen up those stiff muscles! We love that you can choose whatever type of massage that you want with the useful handheld controls. 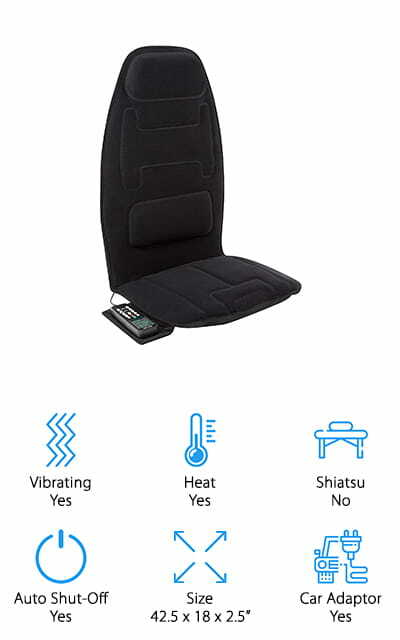 You can control each of the massage zones, the heat functions, and if you want you can even use it with the car adaptor. Relieve your muscle fatigue with as much personal control as you want! 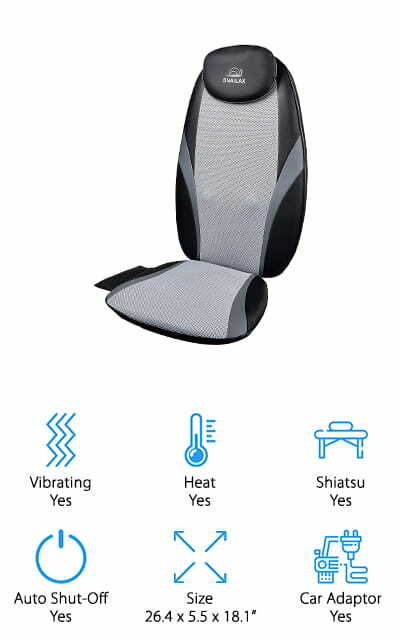 It’s a great massage seat for your home or car! Our choice for one of the best cheap massager pads is this cushion from FIVE S. While it doesn’t have the Shiatsu functionality like some of the other cushions on our list, this is a perfect, simple massage cushion. It still has the heating and vibration functions to keep your back and hip muscles loose and comfortable, and it even works to massage your neck, shoulders, and thighs as well. The lumbar heater is a great way to relieve some of your lower-to-middle back pain, with a control that you can set yourself. 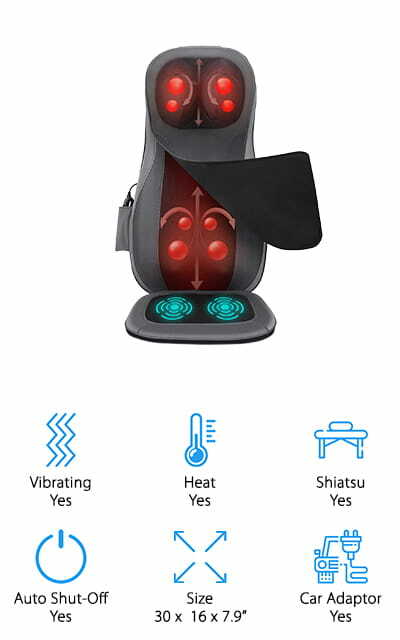 There are three different vibration speeds, 4 different patterns, and you can use this vibrating massage independently of the heat function if you so choose. You can also use the heat without the vibration, which is great for people who might be sensitive to it. We love that this pad even comes with a car adaptor, so you can take it with you anywhere! 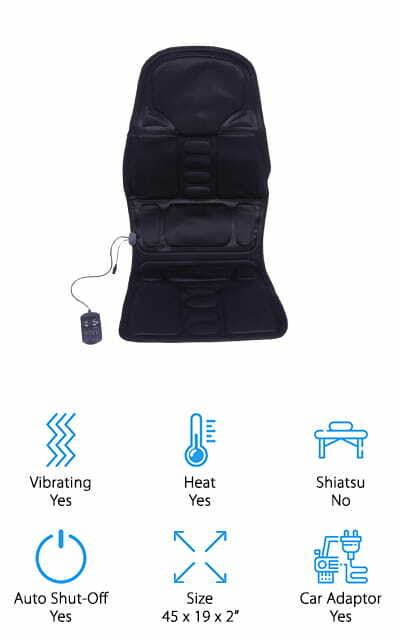 Snailax presents a great shiatsu massage chair pad with this product. It includes 4 nodes that will work to knead your muscles and move up and down within the pad to help your entire back relax. There are three zones that you can turn this on for, including your upper back and lower back independently, and the full length of your back. These nodes are adjustable to more comfortably fit the shape of your body and help hit all of the pressure points that make a shiatsu massage so effective and coveted. You can focus on whatever group of muscles you need to. The seat vibrates, with three adjustable intensity levels, so that your hips and thighs can also feel the comfort of being relaxed and massaged. We love that you can use these functions independently, so you can target whatever type of pain that you have and get rid of it at the source. 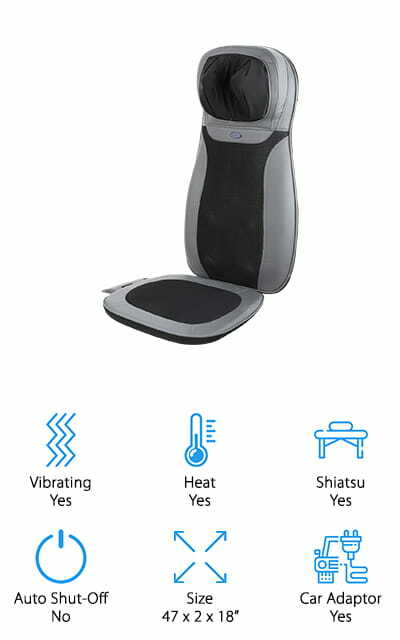 This heated massage chair pad from Gideon is a great addition to your office or home! It includes four different shiatsu massage nodes that can travel the length of your back or focus on one area if that’s what you need. There are also four nodes that only focus on the neck and shoulders, controlled independently if that’s the type of massage that you need. You can also adjust and move these nodes to accommodate your height. It has a vibration function with two different levels, as well as a rolling massage. Not many cushions on this list feature the rolling massage, which uses a cylindrical node running up and down your back to ease the tension out of those tight muscles. The rotating balls create a deep, effective massage that will get you well on your way to relax! And you can set all of these functions exactly how you like using the wired handheld controls. Relaxen makes this heat and massage pad for chairs anywhere – whether that’s your home, office, or car. It’s a super comfortable cushion that’s thicker than similar pads, due to the fifty percent added foam, just in the seat portion. This allows the massage motors to be a little gentler in that area. But not much gentler – there are 10 different massage motors that vibrate on your upper back, middle back, lower back, and thighs. This includes a heating function for the lumbar area so that you can ease your back pain effectively and comfortably. The hand control allows you to switch between five different zones for your massage, as well as 8 intensity levels so you always get the massage that you need – no matter how deep you need it. There are five different modes and speed settings as well! All the extra padding and super intense vibration levels will work out even your tightest, more sore muscles! Relief Expert makes this wonderful heat and massage pad for chairs everywhere in your life. The included car adaptor will help you take this chair pad on the go, which is especially helpful for long road trips! Don’t end up at your destination with a sore back anymore. It has ten separate vibrating motors that can get your muscles relaxed in five different massage zones. It can work to relax your shoulders, all regions of your back, and your thighs and hips as well. We love the five different modes and all of the different settings – with up to three intensity settings depending on how tense you are. Some people find the higher settings difficult to deal with, so it’s definitely good that you can control the setting on this pad with the wired remote. And it’s got a one year warranty as well, so if something goes wrong you’re covered for that whole year. 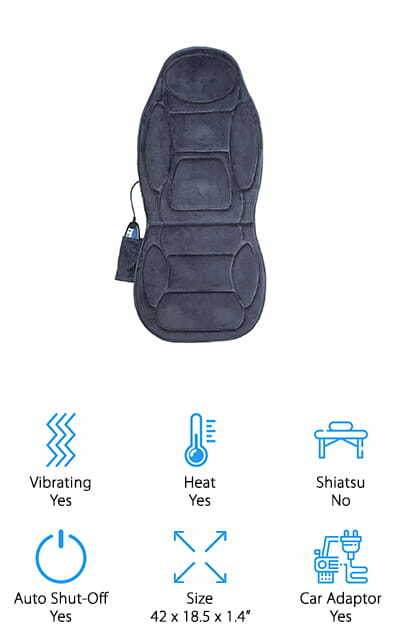 This INTEY Massage Pad is great at relaxing and shaking away all the tension from your tired muscles. It’s a perfect fit for most standard chairs, and you can use the wired controller to focus on a specific area. If you’re having trouble with your shoulders, there’s a function that just works the shoulder motors and shiatsu options to give you the deep tissue massage that you need. This works in conjunction with different heat levels and intensities to give you the best experience you can get without having to step foot in a massage therapist’s office. The thicker neck portion comes with its own separate heating and rotating features to keep your neck from stiffening up. It’s a sound investment, and it’s conveniently portable. Use it at the office or on your long drives to keep your muscles loose and comfortable. The controls are intuitive and let you place the heat and vibration exactly where you want it. 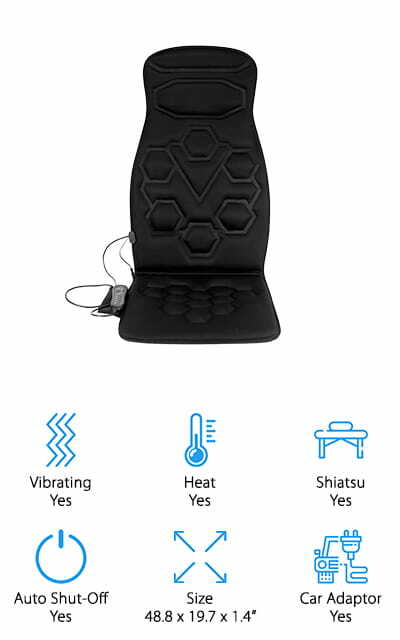 This back massage chair pad by Snailax is great for targeting vibrations on specific spots, like your upper back or thighs. 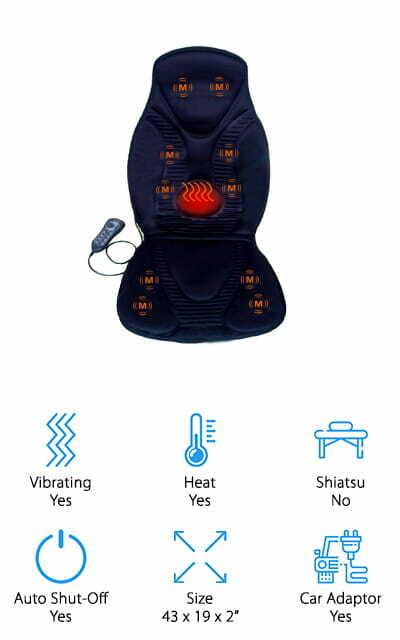 You can direct any one of the six powerful motors to vibrate on your mid or lower back as well, creating a personalized massage that’s perfect after a long day. It will even help to relieve some backaches that come with long rides or drives because it even has a car adaptor so you can take it with you. The bottom of the pad is non-slip, so it won’t slide around even on leather furniture. And you don’t have to worry wherever you use it, because it comes with overheating protection to make sure that it doesn’t get too hot, as well as an automatic shut off timer. There’s even an adjustable strap to help to secure the pad into your seat. This soft cushion is great at helping you reach optimal relaxation! This Comfitech Cushion is probably one of the best massager pads for sale that we found in our research. In addition to the shiatsu massage features, there are an additional ten vibrating motors that will loosen all of those deep knots in your muscles. There are three different strengths you can set the massage too, and you can even focus it on specific points that you need worked out. It radiates warmth to help you relax, gently and soothingly. You can take it with you wherever you happen to be going with the handy dual car and electric plug adaptors. It’s light enough to be portable and convenient! There are 3 straps on the back of the cushion to help it fit most chairs, so you don’t have to worry if it’s going to fit in yours. It’s fully adjustable and you can fold it for storage! We know you’ll love this cushion if you give it a try! Moor makes this great office chair massage pad that you can use just about anywhere! There are eight full vibration modes that you can use to find your perfect relaxation, as well as heat for extra relief from tired muscles. There is a ‘wandering massage’ feature, which uses rolling motions to mimic what it’s like to go to a real massage therapist. A unique feature on this pad is the timer, so you can set the chair to run in either 15 or 30-minute windows so you can take short naps safely while you’re using the pad. And you won’t have to worry about it overheating, either. It’s lightweight and portable, and the vibration modes paired with the heat will help work away all of your stress. We love the different features that this pad offers compared with the others on this list! If you don’t like it, you can get your money back in six months!